Magic is one of the three primary skill groups in Skyrim (Combat and Stealth being the other two). The five major magic skills (Alteration, Conjuration, Destruction, Illusion, and Restoration) correspond to the five schools of magic in Skyrim within which every spell belongs. Enchanting serves as the crafting skill for magic and uses a different set of mechanics. This article talks about general aspects of magic, including features common to all five spell-casting schools. Each of the five schools of magic includes a set of Magical Effects; the type of magical effect a spell employs determines which school it is in. A spell cast from a particular school is influenced by the active effects, level, and perks that a character has for that magic skill. Casting a spell under the right conditions will grant experience towards its respective skill. For example, Restore Health is a Magical Effect in the school of Restoration, therefore spells that restore health are part of the Restoration school. The cost and effectiveness of casting a healing spell is affected by your Restoration perks and skill level, and each time you successfully restore health from casting a healing spell (the condition for gaining experience from such a spell), your Restoration skill will progress. Dragon Shouts, while in many ways similar to magic, are covered separately, since they are not governed by magical skills/schools and do not deplete your Magicka. To use a magic spell, you must first select it from your list of available spells and assign it to either your left or right hand. Some spells will trigger immediately upon the attack button being pressed and can be maintained as long as the button is held down, e.g. Destruction spells like Sparks and Wall of Flames, or Telekinesis. Others require the button to be held to charge the spell and then released to cast it. Charging or casting a spell depletes the caster's Magicka based on the spell's cost (see below) and will continue to do so if the spell is maintained. If you try to cast a spell with a cost higher than your available Magicka, the spell will not charge or be cast and the Magicka bar will flash blue. The effects of a successfully cast spell will usually be aimed in whatever direction the caster is pointing or will simply become active on the caster. Spells that don't target the one using them vary in range: some only work on touch, several are fired as projectiles, some are released in a short-ranged spray, and a few (primarily Master level spells) affect everything within a certain distance of the caster. Summon and Rune spells in particular also have a maximum casting range (which can be increased by perks in the spells' respective trees) meaning that if you try to aim the charged spell too far away from you, your reticle will turn red and the spell will fail if you release it. The equipment multiplier is 1 minus all the enchantment reductions added together. Wearing four pieces with a 25% cost reduction for the same school can bring down the cost for spells of that school to zero. Within each school of magic is a perk granting proficiency in 'dual-casting' spells. Without this perk, casting a spell with both hands has the same effectiveness as though cast normally, but twice. However, once a dual-casting perk has been taken, relevant spells can be 'overcharged' by pressing both the right and left attack buttons at the same time, resulting in a single, more powerful effect. The formula seems to be: 2.2x spell effectiveness for 2.8x spell cost (remember, though, that you are casting two spells at the same time so 2 is the base value, not 1). Whether dual-casting is worth it or not depends on school, as well as strategy and your magicka pool. Generally speaking, the school which benefits most from dual-casting is Illusion, as dual-casting increases the maximum possible level of affected creatures and the effect stacks with perks like Kindred Mage or Animage. The Conjuration spells Banish/Expel Daedra and Command Daedra can similarly be dual-cast to affect higher-level summons, but Restoration's Turn Undead spells do not affect higher-level undead when dual-cast. Other Conjuration spells, the Alteration school, and protective spells from the Restoration school gain duration only, which is of limited use. Healing spells actually lose magicka effectiveness when dual-cast, as they heal 10% faster but for 40% more magicka. Similarly, Destruction spells deal 10% more damage for 40% more magicka, unless you manage to push the Magicka cost to zero, leaving you with 10% additional damage at no additional cost; however, the Destruction school's Impact perk causes dual-casting to stagger an opponent, and may be well worth using regardless of increased Magicka cost. Many magic effects show their duration in pseudo-real-world time, though they're actually based on in-game time, which moves 20 times faster. Thus, an effect that's described as lasting for "1 hour" might actually remain active for 20 in-game hours. It would only be an hour in the real world if you didn't use the Wait or Fast Travel features and didn't pause the game during that time. Some spells will continue to linger for a while, usually with lessened magnitude, after the duration shown in the description is over. At individual spell pages such durations are documented as "duration+linger_time". Concentration spells do not have a set duration. Rather, the duration is determined by how long you hold the casting trigger. Where Taper Weight, Taper Duration, and Taper Curve are set by the individual effect. Taper Weight sets the magnitude when time = 0, that is, the initial magnitude, before it changes. Taper Duration sets the maximum duration of the tapering, because when time = taper duration, the magnitude reaches 0. Taper Curve sets how quickly the effect tapers. A value of 0 is perfectly flat (5 damage for 5 seconds is actually 5 damage every second until the effect expires). A value of 1 is linear, so 1 second into a 5 second effect will hit for 4/5 magnitude (in our example, 4 damage at second 1, 3 damage at second 2, and so on). A value greater than 1 means the value drops off faster, so much more occurs earlier in the duration. For example, with taper curve 2 (quadratic diminishing), our example becomes 5 damage at 0 seconds, 3.2 at 1 second, and 1.8 at 2 seconds. A value between 0 and 1, likewise, means it drops off more gradually; our 5 damage example would be 5, 4.47, 3.87. Negative values mean the damage increases over time, in a similar fashion; this means values below -1 deliver absurdly high amounts of damage as time gets closer and closer to the maximum duration. You can learn spells that have a difficulty level above your current skill level in the respective school and can cast those spells provided you have enough Magicka to do so. 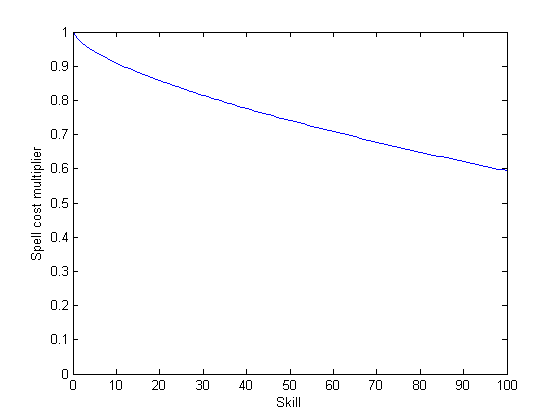 Skill perks can be unlocked that decrease the Magicka cost of all spells of a given difficulty level within a given school, provided you have the required skill level to unlock them. You can learn new spells by reading Spell Tomes, which can be purchased from merchants or can be found in some dungeons. Note however that merchants will not begin selling higher level spells until your skill in that school has reached a level near the spell's difficulty level. Furthermore, most master level spells will only be available after completing certain quests. Unlike previous installments in The Elder Scrolls series, custom spell-making is not available in Skyrim. Magic Resistance, Spell Absorption, and Absorb Magicka are three different effects and do not stack together. Spell Absorption is calculated before Magic Resistance, allowing the best possible outcome when hit by offensive spells. Magic Resistance decreases the damage of any offensive spell by the displayed percentage. Stacking is possible, but total Magic Resistance is capped at 85%. Spell Absorption is a percentage chance to completely nullify effects of a spell and, if the spell had a Magicka cost, add the casting cost of the spell to your Magicka. Stacking is possible, but the effect has very limited availability in the game. Still, there are a few ways to get 100% Spell Absorption, all of which involve the Atronach Stone. A bug may cause your own Summoning attempts to be absorbed, resulting in the spell failing. Absorb Magicka (a.k.a. Drain Magicka) transfers points of Magicka from the target to the person wielding the weapon. On the target, the effect is comparable to Damage Magicka; on the user, the effect is comparable to Restore Magicka. Alchemy is not considered part of the magic skill group in Skyrim. Instead, it has been shifted to Stealth, where it is that group's crafting skill. The school of Mysticism no longer exists in Skyrim. Its magical effects have been moved to other schools of magic. Unlike in Oblivion, magic must be equipped to a specific hand (or both hands), and doing this automatically unequips whatever was there previously. Spells can be cast for free with sufficiently high enchantments. With 100 Enchanting skill, all 5 Ranks in the Enchanter perk, and the Insightful Enchanter perk, you are able to enchant a helm, chest piece, ring, and amulet with a 25% spell cost reduction in a specific school for a total of 100% cost reduction. With the Extra Effect perk, an additional magic school can be cast for free. In Skyrim, magic is not affected by armor, except for the Mage Armor perk in Alteration. NPC mages do not suffer from reduced magicka regeneration during combat. If you attempt to cast two spells at the same time, but only have enough magicka for one of the spells, random behavior can occur that causes you to lose magicka for one or both spells, with either one or no spells actually being cast. This page was last modified on 28 September 2018, at 01:33.